This was one of the very first Varjak Paw translations that appeared, so it still means a lot to me. It felt totally magical to see the cover with a different language on it; amazing to think that there would be people who thought of this book as 'Sny Kota Warlapa'. At the time, a Polish friend told me the title meant something like 'The Dreams Of Warlap The Cat'. I really like that. I love the idea of putting the dreams right up there in the title, as they really are central to the book. 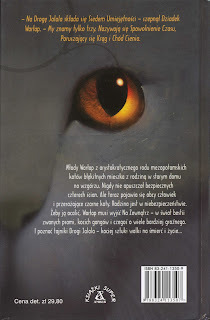 When I was 13, I read a book Varjak paw, now I'm 20 years old, I'm still waiting for book 3. You have not yet thought to write a third book Varjak? You write about it in my blog? Hi Ilya, thank you for your comment. Yes, I will definitely write a third Varjak book one day. I've written a bit about this question here. In the meantime, I hope you will try my new book Phoenix - it might sound different, with humans & aliens instead of cats & dogs, but I think underneath the surface it's a similar story, and if you enjoyed Varjak, I hope you will enjoy it too! I'll wait for the third book and read Varjak paw, Phoenix as soon as it will translate into Russian! Thank you Ilya! So far there's no Russian translation of Phoenix, but maybe if you write to the Russian publishers of Varjak Paw (Azbooka) and tell them that you would like to read it, they might do it! I can try, but I do not think that they will hear. Do you have other friends who also enjoyed Varjak Paw? If so, it might be an idea to ask some of them to write to the publishers too, to show them that there are people who would read Phoenix in Russian... It might even be worth trying to set up some sort of internet campaign? I have no friends who read Varjak, but I know Varjak fan community, I can write to them! Great idea! Good luck, Ilya - please let me know how it goes! Varjak does not mean Warrior in Polish, "Wojownik" does (pronounced:Voyovnik). Great book though (I read the English one even though I'm Polish. Thank you very much for the information! Does the word 'Varjak' or 'Varyak' have a specific meaning in Polish? And thank you for your kind comment on the book - it means a lot to me. The only sad thing is that it is not easily to find your second book "The outlaw Varjak paw" in Poland or it is very high-priced. The first part of Varjak's adventures I have read in Polish, the second I am going to read in English. Please, wish me luck to latch onto one piece! Thank you for your work, you are awesome :) And thanks to Mr McKean for the illustrations - they bring unusual climate over reading. Thank you so much for your wonderful comment, and your kind words about my work! It always means a lot to hear from readers, but it's especially amazing to know that my books have found readers around the world. Good luck in finding The Outlaw Varjak Paw! There will be a third book about Varjak Paw one day; I haven't started writing it yet, but will have written a bit about my idea for it here. In the meantime, do you know about my new book Phoenix? It's not about Varjak, or even about cats, but I think if you enjoyed Varjak Paw, you will enjoy it too, as it comes from the same place! Thank you very much for your message. I'm afraid I don't know where you can by the Polish translation - I think quite a few were printed, so it should be possible to find it second-hand. The Polish publishers were called Amber.